Discussions Magazine Music Blog: SPAZ reviews SPEAR OF DESTINY's new 2CD Singles Collection! SPAZ reviews SPEAR OF DESTINY's new 2CD Singles Collection! "While he hasn't quite achieved the fame and fortune of his contemporaries, British post-punk icon Kirk Brandon has remained one of the genre's most beloved artists. From his late-‘70s recordings with the Pack to his groundbreaking work with Theatre of Hate between 1980 and 1983, Brandon's unique musical vision gained him an enormous amount of respect from critics and adulation from fans. 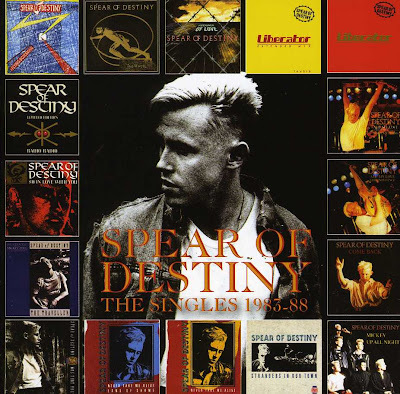 When he suddenly split up TOH in 1983 and formed Spear of Destiny, it came as a complete shock to those who had followed them from their early singles to their album Do You Believe in the Westworld (produced by the Clash's Mick Jones). But Brandon's musical vision had changed and he needed a new vehicle in order to showcase the next musical step in his career. While not entirely dissimilar to TOH, Spear of Destiny allowed Brandon to both expand and streamline his sound. While not exactly the most commercial of bands during their most successful period in the mid- to late ‘80s, SOD were one of the most unique bands of the era. While SOD may not technically be a punk band, or even a post-punk band for that matter, Brandon was still a punk at heart and didn't bother ironing out the rough spots for the sake of commercial consumption. On the other hand, his music was much more accessible than TOH's, introducing him to a larger audience. Although many of his punk fans followed this new venture, many of Spear of Destiny's new fans were either unaware or uninterested in what had come before, which gave Brandon's unique vision a new lease on life. If that wasn't enough, Disc Two offers up 12" remixes of most of the tracks on Disc One (including an excellent dub mix of "Come Back," which brings its reggae vibe to the fore) plus an extended mix of "Land of Shame" (from the Outland album). Though some may not have considered SOD a band worthy of many 12" mixes, this second disc is a true revelation.